Ready to make the switch from fluorescent to LED linear bulbs but not sure where to start? Sick of stocking two kinds of lamps to light your facility? Want to utilize your old fixture’s ballast until it wears out but don’t want to replace the bulbs when it does? We’ve got you covered. Let’s start with the basics though. If you are still using fluorescent lamps inside your linear fixtures, you’re missing out on some serious energy & maintenance savings. LEDs cost slightly more upfront, but they more than pay for themselves in the long run. T8 LEDs last over three times as long as fluorescents and reduce energy usage by up to 75%. And there is just no comparison when it comes to light quality. You’ll notice cleaner, brighter light that stays bright as well as a much more palatable color temperature. Which Bulb Should I Choose? A. Ballast Bypass: Requires removal of the ballast and direct connection to line voltage by a qualified electrician. By eliminating the ballast, the LED won’t go out due to ballast failure. B. Plug & Play: Requires no rewiring, simply switch out the power, remove the fluorescent bulb and snap the LED in place. However, the ballast will eventually fail before the LED light will. Meaning at some point, you’ll need a qualified electrician to replace the ballast for the fixture to work. C. Hybrid: Can be used as either ballast bypass or plug & play. Use as a plug & play until the ballast fails then rewire the fixture and use the same bulb as a ballast bypass. Best of both worlds! 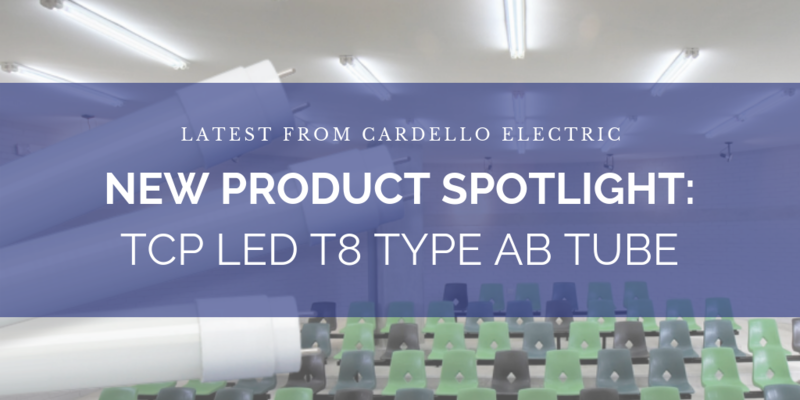 Introducing the all new LED T8 Type AB Tube from TCP. These T8 tubes provide both Direct Wire or Plug and Play application and are compatible with many Instant and Programmed Start Ballasts. With it’s dual capabilities, you’ll get the most usage out of your fixtures and for those who are utilizing both ballast bypass and plug & play methods throughout their facilities, you’ll no longer need to stock both solutions. View the Spec Sheet here. Plus, the LT815AB41K is on special at Cardello Electric for only $7.99 during the month of February!